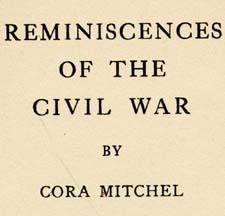 Cora Mitchel Reminiscences of the Civil War. Reminiscences of the Civil War. Providence: Snow & Farnham Co., [1916?]. Apalachicola (Fla.) -- History -- Civil War, 1861-1865. United States -- History -- Civil War, 1861-1865 -- Refugees.